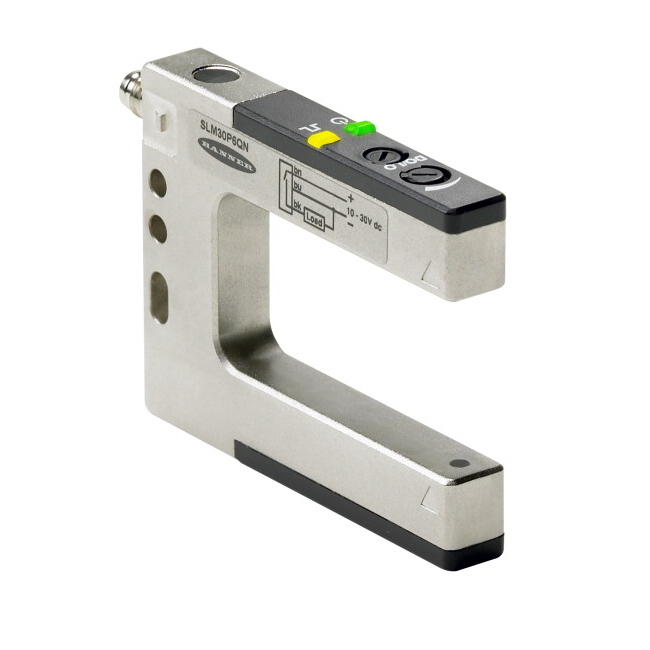 SLM Series: Rugged Metal Fixed-Distance Slot Sensor. Slot Width: 180 mm; Input 10-30V dc. Output: bipolar: 1 NPN 1 PNP. 2m (6ft) Cable. SLM Series: Rugged Metal Fixed-Distance Slot Senso. Slot Width: 180 mm; Input 10-30V dc. Output: bipolar: 1 NPN 1 PNP. 6 inch (150 mm) PUR pigtail Euro-style QD. SLM Series: Rugged Metal Fixed-Distance Slot Senso. Slot Width: 180 mm; Input 10-30V dc. Output: NPN. Integral Pico Quick Disconnect; 3 pin. SLM Series: Rugged Metal Fixed-Distance Slot Senso. Slot Width: 180 mm; Input 10-30V dc. Output: PNP. Integral Pico Quick Disconnect; 3 pin.